China was supposed to be the saving grace of the global auto market, pitched by auto makers and analysts as an endless area of opportunity and growth. Instead, China's October auto sales numbers have been another disaster, a harbinger for an accelerating global slowdown for the industry. Automobile sales were down 12% y/y in October, sliding to 2.38 million, according to the Wall Street Journal. And with this dreadful annual comp, 2018 has now turned negative for overall Chinese auto market. A quick breakdown: passenger car sales fell 13% in the month to 2.05 million, down 8% for the third quarter. Passenger car sales were off 1% for the first 10 months of the year. That puts them down 1% for the first 10 months of the year, on course for their first yearly decline in nearly three decades. Sales of commercial vehicles were down 3% last month to 333,000, but at least remain slightly positive, up 5.5% for the year. The silver lining were electric vehicles: they were the sole area of growth last month, posting a gain of 51%. For the first 10 months of the year, sales were up 76% to 860,000 fueled by government subsidies and favorable policies, as well as still prevailing novelty. However, keep in mind the sample size is still small enough to barely register. This 12% drop for China follows a similar drop in September and a 4% decline in both July and August. It was the steepest drop since late 2012, which also marked the fourth consecutive month of declines at the time. Yao Jie, vice secretary general of CAAM (the China Association of Automobile Manufacturers) commented at a press conference in Beijing: “Maintaining positive growth to the end of the year won’t be easy. There could be negative growth." As noted above, if that happens, it would be the first time since at least the early 1990s that annual car sales in China have contracted. CAAM had originally forecast a 3% rise for the year, in line with last year’s growth, though sharply down from a 13.7% gain in 2016. What is remarkable, is that unlike many other slowdowns the Chinese government has so far refused to intervene and stimulate the market. In the past, during periods of sharp slowdown, Beijing has proceeded with tax cuts, and while some analysts still believe that this is possible even despite the ongoing trade war with United States, the Chinese manufacturers association doesn’t think that a tax cut is the answer. Shi Jianhua, the association’s deputy secretary-general, told the Wall Street Journal, "We do not advocate short-term stimulus measures. We support long-term policies that can help the industry to grow at a slow and steady pace." 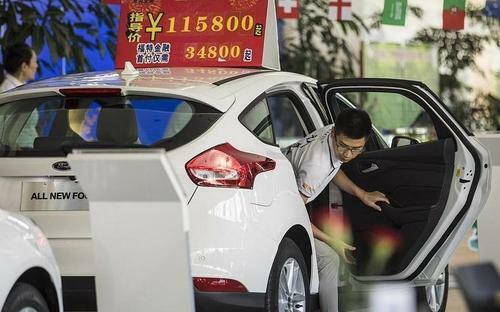 As a result, China has now conceded that 2018 vehicle sales, in total, will fall short of the 28.8 million that were sold last year. Further weighing on the auto industry is the ongoing stubborn bear market in Chinese stock prices leaving citizens with less disposable income. China could wind up a huge (and somewhat unexpected) contributor to a major global pull back in the automotive sector because it has widely been seen over the last decade as an opportunistic spot for growth by auto makers. For instance, companies like Tesla (of course) have recently cited China as a way to gain a bigger slice of the global auto market. Auto sales in the United States and Europe have already started to plateau or fall, but China was widely seen as a remaining area for opportunity. Obviously, that changes now. Just weeks ago, we noted that China was mentioned very cautiously by automakers, many of whom were offered pessimistic forecasts for the remainder of this year. Renault recently blamed its poor numbers on a global slowdown in sales in places like China and Europe, as well new emissions standards. Volkswagen also recently cut its sales forecast for China, citing a slowdown in the country as well as the looming trade war with the United States. China's slowdown has also hit names like General Motors which last month reported a 15% drop in China deliveries for the three months ended Sept. 30, the first quarterly report since the trade tensions with the U.S. began escalating in July. 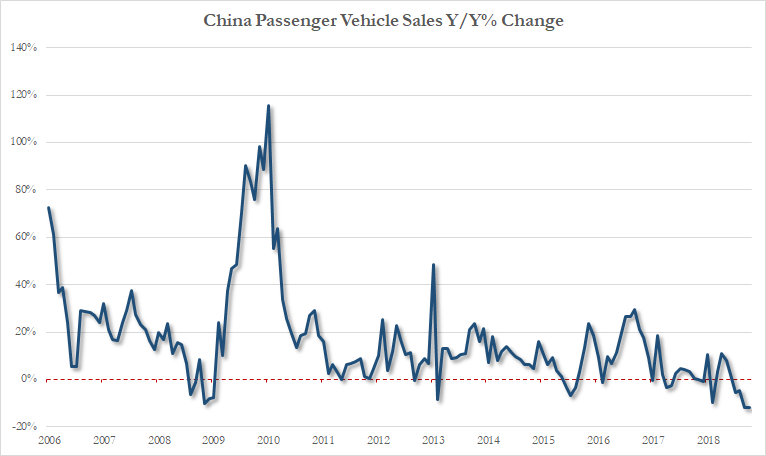 When we last looked at the Chinese auto sector last month we quoted Bloomberg Intelligence analyst Steve Man who said that "the slump may be the biggest that auto manufacturers have ever experienced in China." And just like in the US, weaker brands will be hit disproportionately, forcing price cuts to boost sales, Man said. Some carmakers may also be forced to shutter factories to reduce inventories and lower costs. The end result could be another deflationary wave coupled with China's biggest nightmare: mass layoffs.